Epic Tweet From Wrestling History, 2/28/13 - WrestleCrap - The Very Worst of Pro Wrestling! 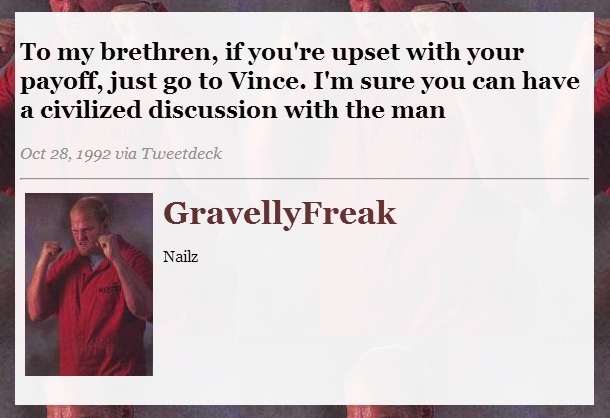 Why did Nailz wrestle in his jumpsuit? Did the prison actually let him keep it? 3 Responses to "Epic Tweet From Wrestling History, 2/28/13"
What kind of crappy work release program did that prison have, anyway? He threatens to kill The Big Bossman FROM INSIDE JAIL and they let him out anyway? Must have been a Friday afternnon hearing by the Parole board I think!